Your senior pastor has just stepped down. Your church is at a loss. Where do you go from here? 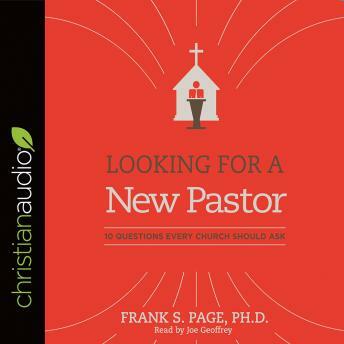 Looking for a New Pastor: 10 Questions Every Church Should Ask, is a product of more than three decades of full-time, pastoral ministry from Frank Page. This is truly one of the most practical works on the subject that has ever been published. Using Scripture as the foundation and real-life examples of searches done well and searches gone bad, Frank Page gives advice on what to look for, what to ask, and what to do. The importance of having a pastor who will shepherd your flock well cannot be overstated. With this book, Frank Page has provided a great resource for churches seeking to discern the will of God in their search for a pastor.